Like many of you, I have read Eric Carle's books to my children since they were babies. I consider my five year old daughter an expert on his books and asked her to share some thoughts on her favorites. 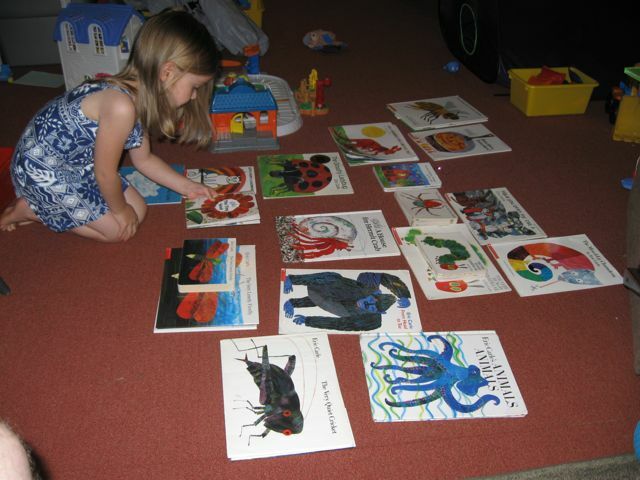 We gathered up all of our books by Eric Carle and laid them on the floor. She then proceeded to line up her favorites and provided commentary on each book. In the end she developed a list she called the Top 13 Eric Carle Books, because she couldn't stop at 10! 1. Today is Monday - I like that this book is about food and it is a song. 2. The Clumsy Click Beetle - This book makes the sound of the beetle at the end. 4. The Secret Birthday Message - I like the secret message in this book. 5. Pancakes, Pancakes - I like the thing that makes the wheat. The mill. 6. The Very Quiet Cricket - It chirps at the end. 7. A House for Hermit Crab - I just like hermit crabs. 8. From Head to Toe - This book is kinda like the hokey pokey. 9. The Very Lonely Firefly - At the end of this book, the fireflies light up and I like that. 10. The Very Hungry Caterpillar - I like it when the caterpillar gets a stomach ache. 11. The Mixed-Up Chameleon - He gets parts from all the animals. 12. Have You Seen My Cat? - I like that the boy asks lots of people where his cat is. 13. Let's Paint a Rainbow - I don't know why? I just like it. Eric Carle's Pancakes, Pancakes makes for a fun morning activity. 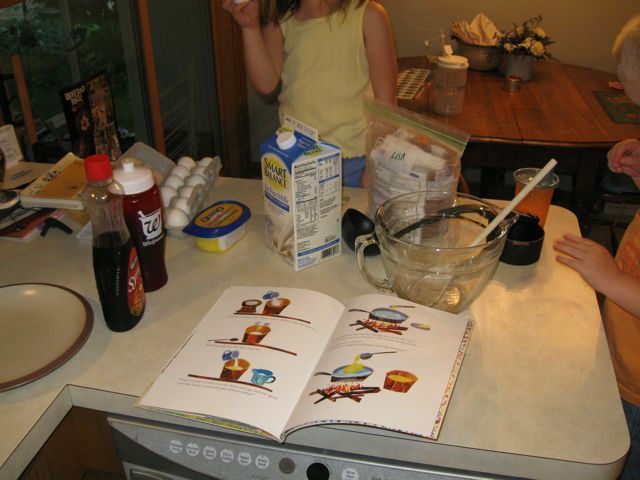 In the book, Jack wants a big pancake but realizes there are lots of ingredients needed to make the tasty breakfast treat. Jack had to head to the mill to have the miller grind the flour, milk the cow, gather an egg from the chicken, and churn the butter. We had it a lot easier by just getting the ingredients from the cupboards and refrigerator. It was interesting to discuss with my children the difference between Jack's way of life and our way of life. However, we did have fresh strawberry syrup we made earlier in the week from strawberries we picked at a farm, so we were a bit like Jack. This week we learned that Jean Marzollo took notice of a photograph by Walter Wick which lead to the I Spy Series. There was a similar situation that lead to the beginning of Eric Carle's career as a children's author and illustrator. Bill Martin Jr. noticed Carle's design of a lobster which lead to them working on the book Brown Bear, Brown Bear, What Do You See? together. Watch the video below to hear Eric Carle discuss his appreciation for Bill Martin Jr. I ran across the book Artist to Artist: 23 Major Illustrators Talk About Their Art while researching for this post. Proceeds from this book support the Eric Carle Picture Book Art Museum in Amherst, MA. I really enjoyed looking through this book because of the pictures that accompanied the text. While reading the chapter on Eric Carle, I was drawn to a piece of artwork he completed when he was in the first grade. In this particular picture his teacher had stamped a cow and a rooster on a piece of paper and asked him to complete the picture. He added a barn and various other farm items. I suggested that my daughter complete an activity much like the one Eric Carle completed. We have hundreds of stamps and ink pads around our house. This activity is so simple, yet it stretched her imagination. My favorite book by Eric Carle is The Very Hungry Caterpillar. I checked out this book repeatedly at the library when I was little. I was mesmerized by the holes in the food made by the caterpillar. I was surprised to learn that Carle's original idea for the book was about a worm, but with a little brainstorming session with his editor the caterpillar and butterfly idea emerged. The video below is of Eric Carle describing the book's transformation. I hope you have fun celebrating Eric Carle's birthday. Eric Carle believes that he has been successful because he kept things simple. His stories are simple, his illustrations are simple, and he focuses on simple ideas and feelings that kids can wrap their heads around. Your author birthday celebrations can be simple too. Just read a book before bedtime and briefly talk about the author. Your children will be excited to know that such a great person is turning 81 years old this year. I didn't realize my daughter shares a birthday with Eric Carle! That's pretty cool. We're big fans here! :-) A belated Happy Birthday to Eric Carle!